"Two G.O.D.s!!" is the forty-second chapter of the Yu-Gi-Oh! ARC-V manga. This chapter was first printed in Japanese in 2019's issue 3 of V Jump, released on January 21, 2018 and in English in Weekly Shonen Jump, on January 20, 2018. Reiji uses the power of his G.O.D card to try and over power Yuya. The latter survives the assault and resolves to fight Reiji with his fathers power, just as Reiji tries too. Duel continues from the previous Scale. 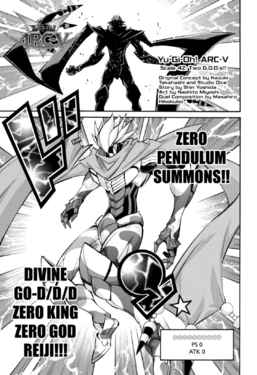 Reiji has just Pendulum Summons "Divine Go-D/D/D Zero King Zero God Reiji" (0/0). He then activates the effect of "Zero God Reiji", tributing his 3 "D/D Dogs" to treat Yuya as having no card in his hand, no monsters on the field, and no cards in his Spell and Trap zones. Reiji then declares an attack with "Zero God Reiji". He explains the next effect of "Zero God Reiji", when the Battle Phase ends, as it has declared an attack, Yuya's Life Points will be set to 0. Yuya activates the Pendulum Effect of "EnterMate ClassiKuriboh". As he controls no monsters, he can tribute it from his Pendulum Zone to negate "Zero God Reiji's" attack and end the Battle Phase. As Reiji ends his turn, the effect of "Zero God Reiji" is no longer active, and "God-Eyes Phantom Dragon" is no longer treated as not being on the field. Yuya obtains this turns Action Card. He then summons "Entermate Turntrooper" and sets one card face-down. Next, he enters his Battle Phase and activates the effect of "Turntrooper" placing 1 counter on it (0 -> 1). He then attacks "Zero God Reiji" with "God-Eyes", activating its effect, increasing its ATK by 1000 for each Dragon-Type Pendulum Monster used as material for its summon. As 3 such monsters were used, it gains 3000 ATK (3000 -> 6000). Reiji responds by activating an additional effect of "Zero God Reiji", allowing him to reduce the ATK of a monster it is battling to 0 ("God-Eyes" 6000 -> 0). Yuya responds by activating the effect of "Turntrooper", as it has 1 counter, Yuya can negate one attack per turn. He chooses to negate "God-Eyes'" attack. As its attack was negated, the effect of "God-Eyes" activates, skipping Reiji's next turn and enter Yuya's next Battle Phase. Due to the effect of "God-Eyes", this turn is skipped. Due to the effect of "God-Eyes", this turn starts at Yuya's Battle Phase. As he has entered his Battle Phase, Yuya activates the effect of "Turntrooper", placing a counter on it (1 -> 2). He then activates the third effect of "Turntrooper", as it has 2 counters, tributing it to banish all monsters on the field for 3 turns. Due to this, "God-Eyes" and "Zero God Reiji" are removed from the field.